Growing number of players, notably Monsanto Company and Bayer CropScience, are offering seed companies biological seed treatments to help them customize agronomic solutions in order to bolster agricultural productivity. Other well-entrenched players in the global biological seed treatment market are Valent Biosciences Corporation, BASF SE, Italpollina SpA, and Syngenta AG. The opportunities in the global biological seed treatment market is expected to rise at robust CAGR of 10.2% during 2017 - 2026. By the end of this period, the global biological seed treatment market will reach worth of US$715 mn. Among the various biological seed treatment types, those used for bacterial resistance will fetch major share of revenues over the assessment timeline. US$ 00 million worth of biological seed treatment solutions are expected to be used in bacterial intervention in plants’ growth by 2026 end. Regionally, North America holds sway in the global biological seed treatment market. In the years ahead, the region is expected to rise at the most attractive growth rate and attain US$ 306 Mn by 2026 end. The growth is increasingly propelled by rapid growth in agricultural technologies in the region and growing acceptance of biological seed treatments among agronomists. Growing popularity of biological products among farmers and agronomists with the key aim of improving the yield potential of crops will bolster revenue generating potential of the global biological seed treatment market. The expansion in the global biological seed treatment market rides on the back of growing focus on sustainable and holistic agronomic solutions to bolster yield. Biological seed treatments over the past several years have shown great prospects in improving products productivity on variety of aspects. Various vendors in the global biological seed treatment market are offering products that promise to improve the water and nutrient intake in various plants, such as corn and cash crops. In addition, biological seed treatments have shown effectiveness in protecting plants against a broad range of pests and diseases, thus being a key determinant of crop yield. 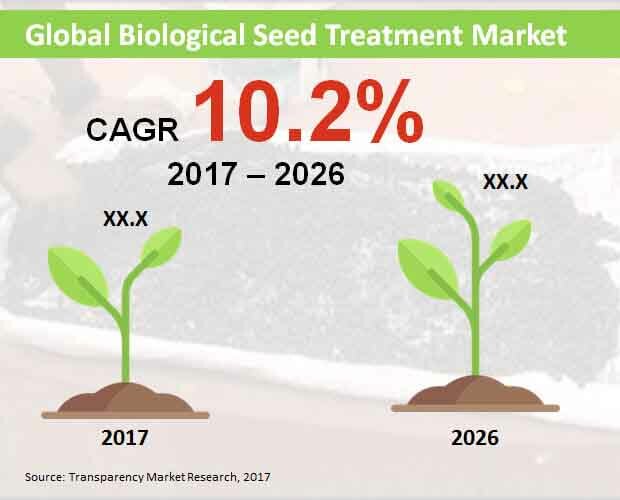 Marked momentum in the global biological seed treatment market has come from the growing potential of biological seed treatment in ensuring global food supplies. This has become increasingly crucial in the face of burgeoning food consumption, especially in developing and developed regions. Growing relevance of biological seed treatment for rare plant diseases is also boosting the market. Over the past few years, unfavorable environmental conditions and an uncertain weather have played havoc on global yield. The market has also been witnessing solid impetus from growing focus on sustainable agriculture. However, biological seed treatments have still a long way to go for being mainstreamed in global agricultural practices. This may due to several reasons. The high cost of such treatments in cost-sensitive regions is a case in point. Moreover, lack of awareness about the favorable science behind biological seed treatments has also been hampering the prospects in the global biological seed treatments market. Nonetheless, agrochemical companies are proactive in spreading the awareness about the role of biological seed treatment in long-term sustainability of agriculture. Moreover, the advent of cost-effective solutions, coupled with recent strides made in the agriculture industry, is boosting the market. Further, numerous agrochemical chemicals have been spending sizeable sums on multidisciplinary research for developing better-performing biological seed treatments. This is likely to pave new and lucrative avenues in the global biological seed treatment market.